I am excited to announce that Bronner Brothers Retail has given me the opportunity to review their Tropical Roots product line. This article will primarily focus on reviewing the Stimulating Growth Oil however, I will also be reviewing three other product reviews from this line as well. Each product within the Tropical Roots line, has two main ingredients, pineapple and guava. Pineapple is rich in Vitamin C, E and has Bromelain. Bromelain, an enzyme found in pineapple, removes impurities, shrinks pores, and makes your skin glow. Guava also has vitamins A, C, & E but it also provides shine to the hair, deep conditioning through the high vitamin and anti-oxidant properties, and removes frizz. Other ingredients in the Stimulating Growth Oil consist of: Canola Oil, Isopropyl Myristate, Castor Oil, Sweet Almond Oil, Vitamin D, Vitamin Am Cyclomethicone, Sheep Sorrell, Sage, Ginseng, Yarrow, Wheat Germ, Slippery Elm Bark, Henna, Comfrey, Burdock Root, Goldenseal, Cherry Bark, Black Walnut, Chamomile, Alfalfa, Hyssop and Fragrance. What is Tropical Roots Growth Oil? 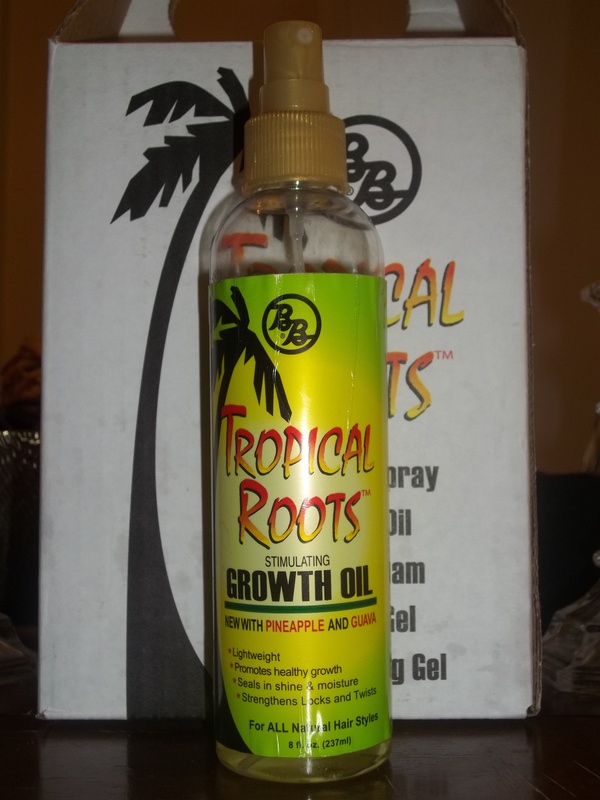 Apply BB Tropical Roots Stimulating Growth Oil to hair and scalp. Use your fingertips to massage into scalp. For hot oil treatment: Apply BB Tropical Roots Stimulating Growth Oil to hair and scalp. Use your fingertips to massage into scalp, place a plastic cap over hair and sit under a warm dryer for 5-10 minutes. Rinse with lukewarm water. Towel dry and lock with BB Tropical Roots Locking Gel. I have to say, the Stimulating Growth Oil works really well. Since using the product I have noticed a big change in my hair and its growth. My hair is shinier, softer, more moisturized and my scalp is not as itchy. I use this oil as a sealant and a prepoo for a hot oil treatment before I deep condition, and a finishing mist after styling. A light mist of the Stimulating Growth Oil to the hair is enough for gloss and moisture. If you apply the oil too heavily, your hair will be moisturized but greasy; three or four pumps to the hair shaft is sufficient. You can purchase the Tropical Roots product line at your local Sally’s Beauty Supply Store, WalMart, or local beauty supply carrier. The next Tropical Roots product review will be on their Shampoo Spray, see you then!! !